Adults can consent to their own medical care, generally without the need for anyone else's input. But children--typically, minors under the age of 18--cannot provide legal consent. When a parent or legal guardian is not available to give consent in person, he can create a written power of attorney allowing someone else to consent on his behalf. A health care power of attorney names someone else, called an agent, to make medical decisions regarding your child's care -- the same decisions you would be able to make if you were present. For example, if your child is spending the summer with his aunt in another state, you may wish to give Aunt Sally authority under a health care power of attorney. With the power of attorney, she could take him to the doctor if he gets sick. She is not, however, responsible for paying his medical care, and a health care power of attorney does not put your child on her health insurance plan. State laws determine the rules for creating a power of attorney, so it is important to know what your state requires. 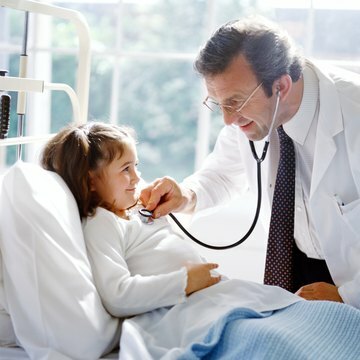 Generally, health care powers of attorney for children list basic information about the child, such as his name, birthdate and address, along with the agent's and parents' names and contact information. Health care powers of attorney typically have an expiration date as well. You can prepare this document yourself using an online legal document provider or attorney, or you may be able to find a form at your doctor's office or hospital. Depending on state law, your power of attorney may require the signature of both parents. For example, Wisconsin state law requires both parents to sign unless one parent has been granted sole custody over the child. Your state's laws may also require you to sign in front of a witness or notary. Once you have properly completed your power of attorney, you can distribute copies to those who need them. You can give a copy to your agent so he has the document available should he need to take your child for treatment. You can also give a copy to the medical providers who are likely to treat your child so they have the paperwork on file if your agent forgets to bring it. If you later choose to revoke the document, it is generally best to get the copies back. While powers of attorney cover both emergency and non-emergency care, your child can receive emergency care even without a power of attorney. Thus, if your child needs emergency care while he is with another adult, doctors can still treat him. However, it is up to the health care provider to decide whether your child's condition is an emergency. If the condition is urgent but not an emergency, the health care provider cannot treat him without proper parental consent. Military enlistment and the possibility of deployment can radically alter family relationships. If you are facing the possibility of deployment after enlisting in the military, you may need to temporarily relinquish custody of your child, and discussing custody arrangements with the child's temporary guardian or other parent prior to deployment can make the process easier. If your relationship with the child's other parent is strained, you may wish to consult a family lawyer with experience in military law.